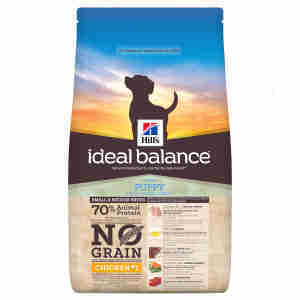 Hill’s Ideal Balance Mature Adult No Grain Cat Food is a complete food for mature cats aged over 6 years old. Made with chicken, this food provides optimum nutrition for your cat in their later years, keeping them slim and healthy. Rich in potato, which is naturally gluten free, the formula aids digestion, reducing the effect of food intolerances. The mix of minerals and vitamins from vegetables and fruits support natural defences. Flaxseed provides Omega 3 and 6 fatty acids ideal for ha healthy skin & coat. Amino acids from eggs reinforce muscle mass. Hill’s Ideal Balance Mature Adult No Grain Cat Food is the ideal nutrition for mature adult cats to maintain overall health in their later years.This food is not recommended for kittens or pregnant or nursing cats. Chicken meal (25%), potato starch, yellow peas (12%), dried peas (12%), dried potato (9%), animal fat, digest, minerals, vegetable oil, flaxseed (2%), dried beet pulp, fish oil, dried carrots (0.5%), dried tomato pomace (0.2%), dried citrus pulp, dried grape pomace, spinach powder. Protein 26.7%, Fat content 18.1%, Crude fibre 2.7%, Omega-3 fatty acids 1.08%, Omega-6 fatty acids 3.13%, Crude ash 7.1%, Calcium 1.27%, Phosphorus 0.98%, Sodium 0.45%, Potassium 0.81%, Magnesium 0.09%; per kg: Vitamin E 730mg, Vitamin C 115mg, Beta-carotene 1.5mg. Vitamin A 36,930IU, Vitamin D3 1,551IU, E1 (Iron) 178mg, 3b202 (Iodine) 1.8mg, E4 (Copper) 22.6mg, E5 (Manganese) 7.8mg, 3b603 (Zinc) 151mg, E8 (Selenium) 0.4mg; with natural antioxidant.